Sign up for either the weekly or every other week delivery option. Before your delivery, a description of the weekly harvest that will be delivered and easy to follow recipes will be posted on Facebook and our website. Add other items to your delivery like local meats, cheese, milk, eggs, bread, salsa, coffee, etc. 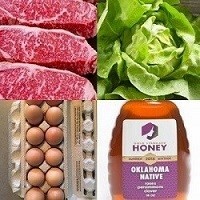 Enjoy the freshest produce Oklahoma has to offer, delivered right to your door. We make eating healthy an easier and more affordable option. You get the freshest, best tasting, all-natural produce available. You are supporting local farms, ranches, and artisans that all have the same goals: Fresh, Local, High Quality, and All-Natural. 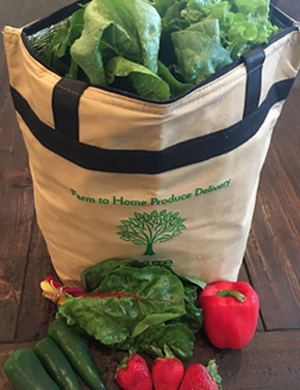 The farm bag is a 4 gallon insulated bag that your produce will be delivered in. On hot summer days, we may need for you to also put a cooler with ice on your front porch to store the bag to ensure freshness. We exchange the farm bag each delivery so it is important to put the bag from the last delivery on your porch by 8:00 am the day of your delivery.